So yesterday I found out as most of the culture surrounding comics did that the iconic alternative comics publishing publisher Fantagraphics was launching a $150K crowd-funder in order to better facilitate their Spring line. I have interview questions out to Gary Groth because there are things about which I am curious but do not know. I'll run that piece when I get the answers. * my first thought? I didn't like it. * my second thought was that I need to get on the site and get something or send them some money. * my third thought was that I wish that my second thought had been my first thought. * and that about covers it. * my inbox filled up pretty quickly with e-mails from folks filled with conflicting emotions. Sometimes that was expressed as such, sometimes it was just on display. * the people e-mailing me also expressed some worry about blowback or it not doing well. That worry quickly dissipated as the crowd-funder started to be extremely well received. * finally, a few people expressed specific opinions about the effort itself that I'll try to fold into my own thoughts here or use in subsequent coverage. * another reason may be that a lot of people seem terrified to express negative or critical opinions in public right now, and I imagine some people feel that I'll say something that they can't afford to say or simply don't wish to engage in the risk of saying. * my main concern when expressing skepticism about crowd-funding with a publisher involved is that in an arts culture that practically breathes exploitation in and out, both casual and severe, crowd-funding might allow publishers to avoid the traditional responsibility of being the person that provides capital. This is problematic in and of itself, because you need capital. It also may reduce what the publisher brings to a publishing arrangement. While this may come with an adjustment in reward for the publisher, or compensation to the artist by way of providing that much more excellence in other ways, my worry is that this is basically a way for a publisher to keep the same profit point for less work done on behalf of that partnership. * Yes, I can certainly comprehend a crowd-funding mechanism simply being the way that publisher raises capital: for a specific project, even in general. I am also fully aware that a publisher does far more than raise capital. * comics is a little bit more complicated than other forms because entire categories of expression are dominated by people that started with very little capital. Fantagraphics is one of those companies! I have all the respect in the world for Fantagraphics' journey to create an idea of a kind of art and then facilitate that art, mostly by throwing themselves at any problem and making do with limited reward. I think in that historical moment that was the only way the alternative comics movement was ever going to happen. * but as many of those struggles that remain, or have never gone away, it is no longer 1981, and I think a different standard should apply now. * so yeah, generally skeptical. * here's the question, then: how does that general skepticism apply here? * I think Fantagraphics' deserved reputation provides a lot of assurances against many of the worries I tend to have about publisher-involved crowd-funders. I know that they are a virtuous company in terms of the money they make and how they spend that money. They are prolific and excellent. The owners have never taken much money out of the company. People are paid modestly. Health insurance is provided. I know that they're a company that has years of displayed skill when it comes to putting together excellent books, that they can bring them to the marketplace and they can handle a hit book if they get one. They are directing the crowd-funding campaign themselves, with vigor, rather than leaving that to the artists involved or doing it in halfhearted fashion. * in other words, I think there's a big difference when Fantagraphics wants to do this as opposed to a person I've never heard of before, maybe someone on a first book, doing it. I know that we pretend that everyone should be treated just the same in the arts or on the Internet, but 35 years of working with artists to put stuff on shelves should buy you something and I think what it may buy you is this. * I am a little confused about several things, and hopefully I get some clarity from the answers to the questions that are now with Gary Groth. I'm not sure I understand why this amount. I don't know that I can figure out exactly how the group of Kim Thompson delayed and cancelled books has a significant effect on the bottom line given that most of them were likely marginally profitable at best. I'm not sure I understand how the money raised will be spent, or why that isn't a primary concern for anyone that gives money to anyone out there that's not a family member or a close friend. * I hope -- and to a certain extent except for the public nature of this plea this is none of our business -- that they will entertain idea of structural reform or changes in the way they do things in order to ensure that they are doing everything to do what they do in the most cost-efficient way possible. On the one hand that is so freaking obnoxious, and they are a prolific company with over 100 books published last year. On the other hand, there's at least one publisher out there that published at a 20:1 ratio of book to employee, and five to seven seems pretty standard according to my figures. But it's less about that and more about I assume this would be a good time to check if things could be done differently. If there are changes that can make Fantagraphics a better business, I hope they're made. * this counts as backseat driving, so I apologize, but I wish there had been a way -- or that they had selected a way -- to do this that works out of their core business model more than out of a campaign that involves extra work. In other words, I think when you are a company that sells books, you and the system in which you operate is better off by making money selling books than, say, t-shirts about books. So I would have been a lot more comfortable had there been a sale. At the same time, I understand there's a certain way that crowd-funders work right now that have an oomph that just selling stuff doesn't, even when the sale is made special. * I am worried as a fan of this company that there may be more systemic work to do. The last time there was a money crisis the company moved into a relationship with Norton and the acquisition of some really excellent licenses -- like the Schulz material, the EC material, the Disney material. Heck, they had Kim Thompson in his workplace prime. I'm not sure that I see a similar positive series of developments coming Fantagraphics' way after this particular infusion of money. It seems unlikely, anyway. So I hope and pray this is enough, or that what's happening suggests other ways to negotiate the fallow times until they decide it's time to close shop. * I would like to see the development of a more active pre-order function for companies like this, or maybe just a culture of doing this, a way to connect with readers that does not count on financial crisis or a kind of ethos of community support worked into a fury in order to work. It seems to me it should be enough for people to pre-order and support and buy in on this company that Fantagraphics makes awesome books and people that like awesome books should buy them. As much as Fantagraphics needs your money today, so do a lot of other comics entities. 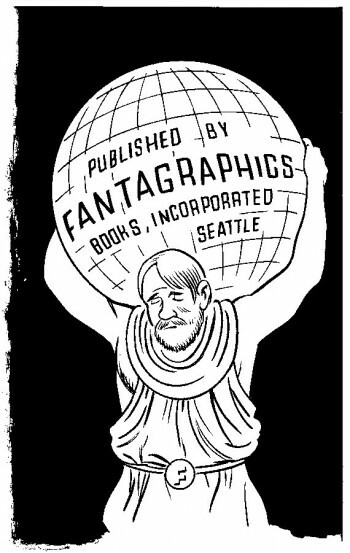 Fantagraphics will need your money tomorrow, too. And next year. And so on. * I'm not sure that we question the general health of the marketplace as frequently as we should, how it works and why and for whom and to what extent things might improve. For instance, we tend to look at publishers and creators doing shows and festivals for a part of their income as an amazing thing -- which it is -- rather than wonder if this is the most ideal outcome. To bring it back to Fantagraphics. Is there much hope for alt-comics if a Fantagraphics armed with Disney and EC and the Schulz material can't find a way to make it work on a regular, ongoing basis? Is there something broken that keeps them from getting there, and if there is, can we get it out of their way? * I'll know more when I get questions back from Gary. * I was not ready to engage with this issue right now, and I probably should have been. * I bought the Eleanor Davis.